Bishop Rey Angana and His wife Alma Villa has been in the ministry for the past 17 years and the Lord was so faithful in keeping them.They are blessed with five wonderful children namely Jethro Rey 17, Joshua Rey 16. Zoe Jeane 13. Russel John 11 and Judah Mer 7. Ministers are recognized and was highly honored for their faithful service to God and people. 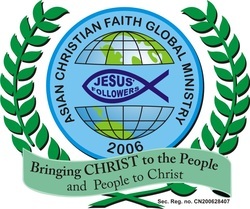 Asian Christian Faith Global Ministries Church members. Pastors tribute hosted by Metro Cagayan Ministers Fellowship Inc. Your financial support can give an impact to the community to touch and change lives of the people that find Salvation.You sow financial support we will reap harvest of souls and God will bless you more.